Authorities say a China Airlines jet exploded into a fireball at an airport in Okinawa, Japan, after arriving from Taiwan on Monday, and all 165 people aboard escaped alive. Police say terrorism is not suspected. All 157 passengers - including two small children- fled the Boeing 737-800 unhurt on inflated emergency slides just minutes before the plane burst into a fireball, Transport Ministry official Akihiko Tamura told reporters. China Airlines spokesman Sun Hung-wen told reporters in Taipei the aircraft skidded on the tarmac on its way from the runway to the gate after landing, starting a fire that prompted the emergency evacuation. The eight-member crew also safely left the plane, Sun said. "The fire started when the left engine exploded a minute after the aircraft entered the parking spot," Tamura said, adding that airport traffic controllers had received no report from the pilot indicating anything was wrong. Nobody was injured. Local fire official Hiroki Shimabukuro said two passengers - a 7-year-old girl and a man in his 50s - had been hospitalized because they felt unwell, but not because they were injured. Tamura put the number of passengers at 157, updating the figure of 155 initially provided by China Airlines. National broadcaster NHK showed footage of a squad of firefighters dousing the empty plane with extinguishers as flames and clouds of black smoke billowed from the fuselage. The fire was put out about an hour later, leaving the aircraft charred and mangled. "After the plane landed, there were flames, and I heard explosions a few times, then saw black smoke," airport worker Hideaki Oyadomari told national broadcaster NHK. "We felt the hot air coming our way." Several passengers interviewed by NHK said they were suddenly told to use the emergency slides to evacuate as they were preparing to get off the plane after what seemed like an ordinary landing. Some said they saw smoke and flames entering the cabin and that they heard explosions minutes after they exited the aircraft. The cause of the fire, which reportedly began in one of the engines, was unknown. Japan's National Police Agency said terrorism is not suspected. 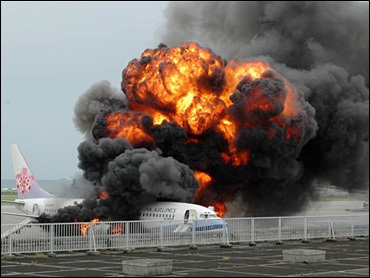 "The plane landed safely so we are still checking why there was a fire," said Sun. Four officials from the Aircraft and Railway Accidents Investigation Commission were at the airport to investigate the incident, ministry officials said. Taiwan's Civil Aeronautics Administration head Chang Kuo-cheng said authorities ordered China Airlines and its subsidiary Mandarin Airlines to ground their 13 other Boeing 737-800s pending a thorough inspection. "If there was a fire, it might have something to do with an oil leak," Chang said, noting that the exact cause has not been determined.